For my fourth project, I decided that I wanted to try my hand at 3/1 broken twill with brocading. After a couple of mistakes in material, I finally settled on 8/2 perl cotton for the warp, with heavier perl cotton for the weft. As one of my previous attempts had left me with a solid warp with which I could do nothing fancy (other than weave up a solid 3/1 twill band 12′ long) I chose to warp my loom with two colors. In this way, if the brocading failed, I could still use the warp for double-face double-turn patterns. I also chose to make the warp fairly short (2 1/2′) so that if there were a disastrous failure, I would not waste too much material. As my warp was shorter, but I still wanted something useful to come out of it in case it worked, I settled on a quote from St. Columbanus (d. 615), suggested by the eventual recipient of the band, Mary Dedwydd verch Gwallter: “Amor non tenet ordinam (love does not concern itself with order).” The pattern is not my own, but is the 36-card textura quadrata font from Guntram’s Tablet Weaving Page. Click here for a close-up of the work in progress. I’m pleased to note that the piece was almost exactly the length I expected it to be (+/- 1″) and so I had a bit of warp left over with which to play. 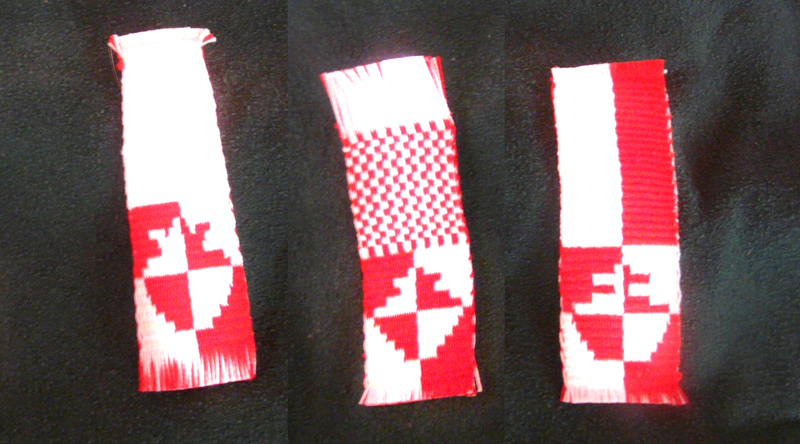 I chose to weave the remainder of the warp into belt tags for Mary’s daughters, featuring her armory, “Quarterly gules and argent, an escallop counterchanged.” Each of the smaller pieces has a built-in space above the armory onto which the girls’ belts can be strung. 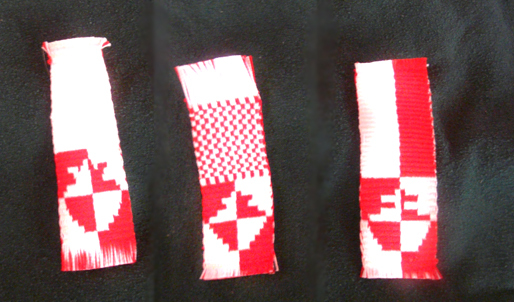 They arranged in order of completion, and each one uses a different pattern for the escallop; I’m still not entirely happy with any of them, but if I make any more, I will probably use the top of the second design and the bottom of the third. I gave these pieces to Mary and her daughters on April 28, 2011. Mary plans to take the lettered band and turn it into an early livery collar, like the one seen here. When she completes the second phase of the project, I hope to add pictures to this page.